Diplarrena moraea or ‘Butterfly Flag Iris and Diplarrena latifolia (pictured right) are two of the more popular of the varieties. These are a perennial that over time form a dense clump. They grow well in the garden border and are also well suited to growing in containers. They can be used in mass plantings for broader landscaping applications. 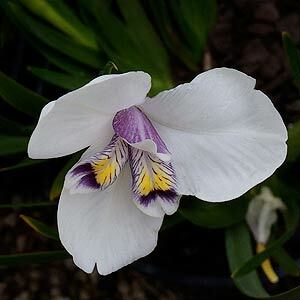 Diplarrena are from the iridaceae family, hence the name ‘white iris’. D. latifolia is from Tasmania and is really a sub alpine plant, the markings will vary a little from light to dark purple and yellow. D. moraea or ‘Butterfly Flag’ is from Victoria and New South Wales, both species grow to about 30cm and do well in the home garden. Diplarrena grow from rhizomes and do well in pots. Diplarrena will flower from early spring right through until summer, they prefer full sun and a humus rich moist soil. Both species are readily available from good specialist nurseries. A well drained moist soil is essential, they grow best in full sun and require little care once established. Spent flower heads and old foliage may be pruned away as required.